When a piece of pottery breaks, there is a Japanese practice known as “Kintsugi” which repairs the breaks using a precious metal – usually gold, but also silver or platinum. 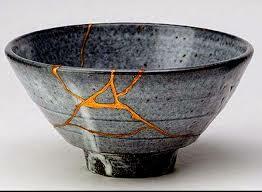 Kintsugi refers to far more than just highlighting the crack or flaw, however; it carries a much deeper meaning. This practice recognizes that the cracks or breaks reveal a deeper character and history of the article, and so are not “repaired” with precious metals merely for their appearance, but to highlight and give honor to the distinctive quality of the pottery. And so it should be with each of us: when we witness the distinctiveness of another – even in their brokenness – we should recognize and honor the beauty that is revealed. That, it turns out, is the other meaning of “Tikkun” – to adorn or embellish. Thus, we are enjoined not simply to repair the world, but adorn the souls within it!